Creating an Article site is now became easy using free Article directory WordPress theme and Premium also there are lot of user friendly features available in this for making worth full websites for submission of the content to get quality back links. It is highly accepted theme because its available with no cost and its has approximately all same functions like premium themes and i have seen lot of successful article sites are using it and working very effectively. This premium Article Directory WordPress theme by templatic and full of all essential features which users need in any content site for submission of post to get back links. 2 – Strategic design for the home page to make it user friendly. 3 – Users can easily add articles by using simple adding form. 4 – The article listing page gives you an option to show more articles in grid or view. 5 – Sign in or sign up for new user registration or login of existing users also. 6 – With design setting you can control every thing from WordPress admin options like skins, Logo, navigation setting, RSS URL, Google analytics code, page layout options etc. 7 – Various types of payment options can be integrated like Pay pal, Google checkout, Authorize.net, 2CO etc. 8 – You can manage discount coupons and offer different packages in this Article Directory WordPress Theme easily. 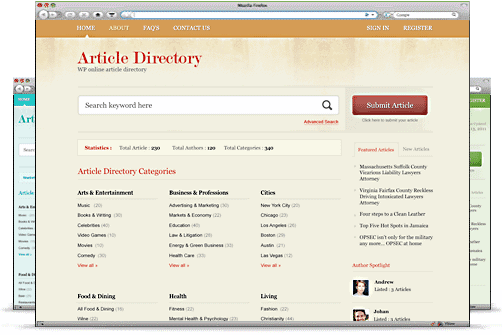 There are lot of great Article directory WordPress plugin also available. You can use mythemeshop coupon code also to buy premium Word Press themes with optimized for search engine optimization and high conversion rate possibility or read review of thrive themes also.